In 1954, Superman first gave his pal, Jimmy Olsen, a signal-watch with which to call him in emergencies. 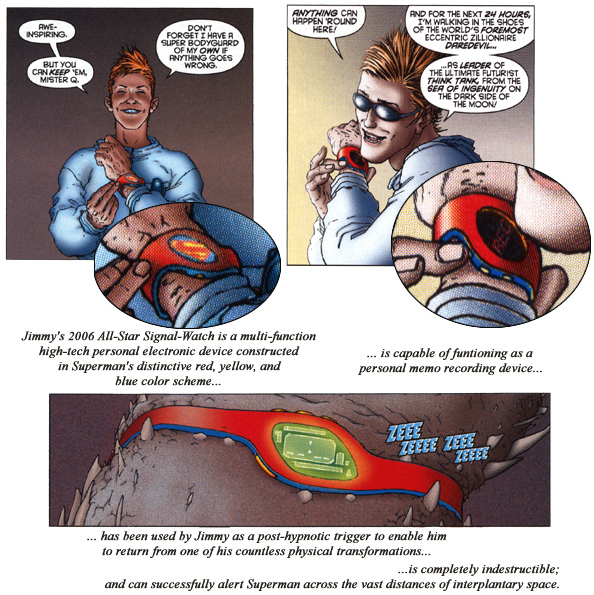 Though it looks like an ordinary time-piece, it is actually quite unique; for, by pressing a hidden signal-button, Jimmy can send a "zee-zee" sound which is inaudible to the human ear, but which is easily picked up by the Man of Steel's super-hearing. By altering the frequency, Jimmy can also send signals attuned to the ears of either Supergirl or Krypto the Superdog. The original signal-watch was an analog watch, with the addition of an ultrasonic frequency generator. This version of the signal-watch had a leather wrist-strap. For much of the watch's history throughout the 1960s to the 1980s, the strap had been upgraded to a flex-metal band, usually gold colored. More recently, the signal-watch has been portrayed as a multi-functional personal electronic device. In 1965, it was reported that Silver, platinum and gold were used in the construction of the signal-watch, as well as Tulanium from the planet Zumoor, Morabalt from Xenon, and Deronium, an artificial element unknown in our time, but which Superman brought back from the 30th century, where he had been visiting the Legion of Super-Heroes. From the space ship which brought the Kryptonian villain Gra-Mo to Earth, Superman took a rare mineral, Tuhanite, found only on his home planet. He thought all the rest of this substance had perished when Krypton exploded; but later, after rescuing the bottle-city of Kandor from the space-villain Brainiac, he found this tiny Kryptonian metropolis had large supplies of it - though reduced to microsopic size. However, this is one part of the watch which will never have to be replaced, since, like other things from Krypton, it is indestructible under Earth's yellow sun. One might imagine that this device would ensure Jimmy's safety at all times; but this is not true. Its signal cannot reach through space, nor can it operate across the time-barrier. 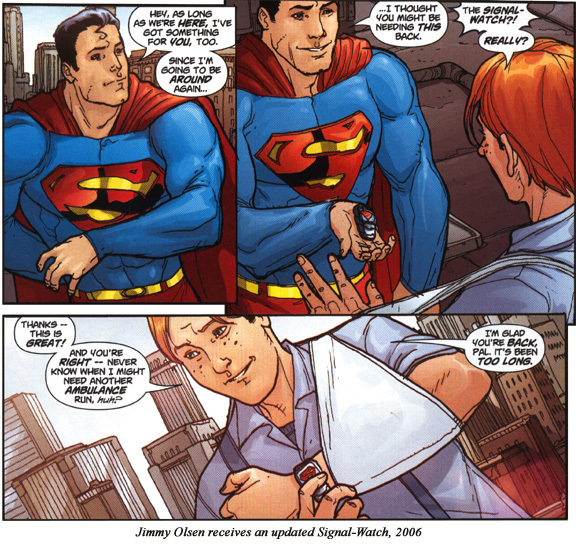 Once, Superman improved the watch so its signal could carry through space, but the first time Jimmy used it, the new part, made of a very rare element, Zenalite, burned and could not be replaced. However, more recently, Jimmy has used the watch from the Moon to signal Superman back on Earth. Another time, when Superman was at the Earth's core on a mission, the signal was stopped by a large deposit of lead; on another occasion, high mountains blocked it. Also, powerful electrical disturbances can jam the signal. Thus, Jimmy cannot always count on Superman to respond to his signal, and so must use his wits to get himself out of difficulties. Criminals plotting against the Man of Steel often try to steal the watch so they can use it to lure their super-foe into Kryptonite traps. Jimmy's ingenuity has thwarted more than one such villain. In one instance a pickpocket lifted the watch and, not knowing what kind it was, accidently called Superman with it. 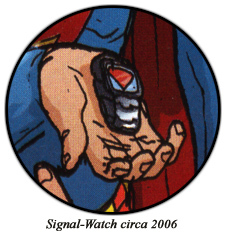 On several occasions, the signal-watch has been broken or damaged, and Superman, while reparing it, has sometimes remodeled and improved it. For this reason, the watch looks a bit different in many of the earlier stories. Oh, yes - in case you're wondering, the watch tells time, too! Original text on this page taken from 80 PAGE GIANT #13, August 1965; with additions and modifications. First appearance of Jimmy's Signal-Watch: Superman's Pal Jimmy Olsen #1, 1954.